Why Wouldn’t You KISS Paul Stanley? Last week, San Diego Kiss fans got to meet rock god Paul Stanley at Warwick’s bookstore at a signing session of his new autobiography, Face the Music: A Life Exposed, which is currently No. 2 on the New York Times best-seller list. Die-hard fans started lining up outside the independent bookstore in La Jolla six hours early. That statement was proven true that night. I was booked to interview Stanley at 6:45 p.m. but was told the singer/guitarist was held up in L.A. traffic. So there it was — the fans in line would have to wait another grueling hour or so to see the music icon. When Stanley finally arrived, he pushed our interview back so he could first see his patient fans. Even though I had another commitment, I had to complete my mission to talk with the Starchild about his microtia, a congenital defect in which the exterior ear is not fully formed; the eerie similarities he has to Lady Gaga; and being inducted into the Rock & Roll Hall of Fame (all to be seen in an upcoming episode of SoundDiego). As soon as the Kiss fans and Stanley caught sight of one another, it was pure Kiss-teria. With every passing minute — and beyond the store’s business hours — each eager fan got his or her book signed and a photograph taken with Stanley. 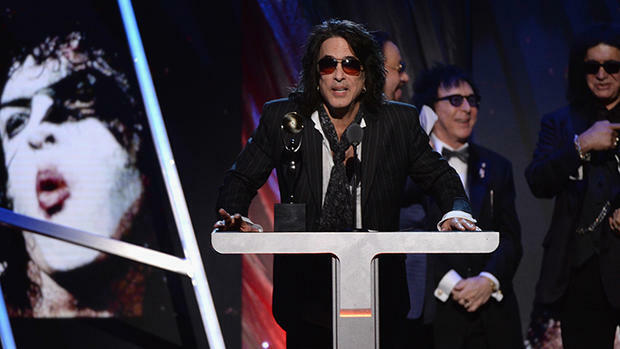 Each recounted a Kiss encounter: their favorite album, how they can’t wait to read the book, how happy they were that Kiss finally got inducted into the Rock & Roll Hall of Fame — this was the result of the 40-plus years that Stanley has contributed to music. Once the bookstore’s doors closed, I finally got my time to go one-on-one with the Starchild. Actually, he signed another 300-plus copies of Face the Music (so if you missed out on attending the signing, you may still be able to purchase a signed copy). I didn’t keep track, but one of the bookstore’s clerks confirmed that Stanley speedily autographed 100 books every 10 minutes. It was past 10 when I finally got the interview. Because of our height difference (Stanley, 6 feet; me, 5 foot 3), we sat for our interview next to Warwick’s Ron Burgundy life-size cardboard cutout, which featured a paisley star-shaped sticker encircling the right eye. The Kiss frontman was poised as hell and a complete gentleman, the complete opposite of the Starchild character we’ve seen rocking out onstage next to his bloody-mouthed comrade, Gene Simmons. Stanley told me he created the Starchild character to compensate for his insecurities, including being born without his right ear. It was difficult to hear he was tormented as a child by names like ”Stanley the one-eared monster.” So for Stanley, creating the Starchild with the superhero makeup and big hair with extraterrestrial guitar and vocal skills was a mastermind escape from the childhood torment he experienced — or so he thought. I think he liked my answer because he gave me a signed copy. I feel ubercool to have met the 62-year-old Stanley versus the ’80s Stanley, because from what he tells me, the earlier version wasn’t the real Stanley. That day in Warwick’s, I met the wiser, cooler 2.0 Paul Stanley.